Listen to John Dean Williamsen explain how important a role your problems play in molding your future. is having the focus or the strength to rise out of the mire so that we can see clearly. Packed with profound insights and easy-to-use strategies for gaining perspective and resolving many of life's most trying problems. The tools are simple yet powerful. You can start using the 4 Cs immediately. I did. Review by Janet Kempe, Kidea, Inc. I now use this system provided by John Dean Williamsen to rise above a challenge and resolve it versus allowing my emotions to overtake my valued time and energy. John carefully explains how to put 'The 4 Cs method' into practice and make it a tool one can use daily, both personally and in business, no matter how small or large the challenge. I'm a worrier. It's something I've done my entire life. In the past, problems have literally dragged me down and overwhelmed me. I just can't seem to move past them. When I finally feel as though a problem has been resolved, it seems to pop up again. The players may be different, but the root problem always seems to be the same. 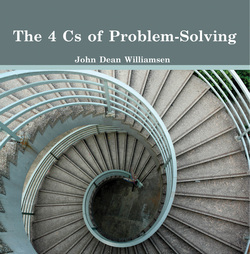 The first time I listened to the 4 Cs of Problem-Solving, it gave me hope. My entire being felt lighter because I was actually being given a step-by-step game plan to solve problems and move on. It also changed my viewpoint on what a problem actually is. Now that I'm looking at my problems in an entirely different light, I feel as though I actually now have the tools to confront them and move on. I'm not fooling myself into thinking that using these four Cs is going to be an easy task. It's not. It's a difficult process but well worth the energy. Through the revelations I've learned listening to this seminar, I know now that problems are actually opportunities for growth. Now that I've learned to look at problems in a more positive light, I feel pretty confident about tackling the 4 Cs and actually moving through my problems instead of floundering in them and never really moving past them. I've listened to this seminar time and time again. Each time, I hear something new and different. If you are like me and have difficulty managing or solving problems, I highly recommend this seminar. I've found it very helpful and will use these tools I've been given the rest of my life. This seminar has been life altering for me and I'm so grateful to have this knowledge.